Have you ever tried making your own homemade nut butter? 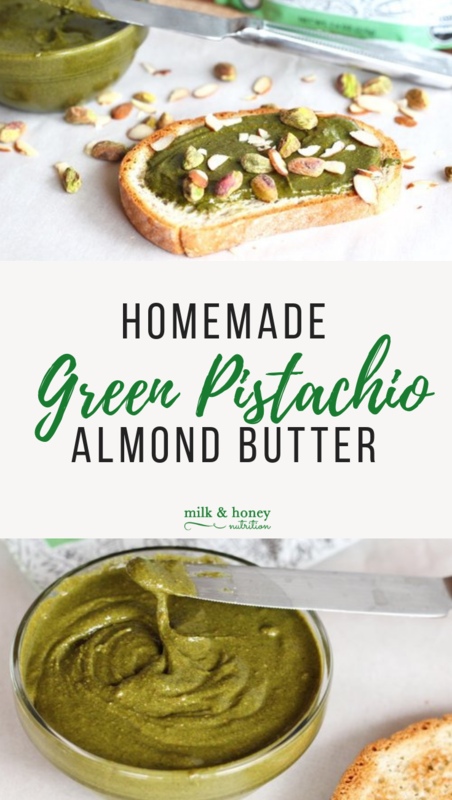 Save yourself the $12+ per jar you'd likely pay at the store for something similar, and try my Homemade Green Pistachio Almond Butter. All you need is a food processor, nuts, and some Natural Citizen Organic Greens. You can even customize this recipe with different nuts, without or without salt, roasted or un-roasted. Each aspect effects the flavor of the nut butter in it's own way. But you may be wondering why I would add The Natural Citizen Organic Greens to nut butter?! Well, it packs a huge nutritional punch and doesn't change the taste of the resulting nut butter at all... trust me, I've tried it both ways! The key is using roasted pistachios. They have a very powerful flavor profile that is very dominant and hard to top. Organic Greens is made with organic moringa, spirulina, alfalfa leaf, and barley grass, and each heaping tablespoon provides: 3g fiber, 30% of your daily iron needs, and 90% of your daily vitamin A needs. That's a big nutritional punch! And just like all of their products, every ingredient (and there's only FOUR of them! No other fillers, or flavors) is organic, non-GMO, vegan, and gluten free. Sure, you can easily mix it into a smoothie or bowl of oatmeal, but why not try adding it to your favorite nut butter like I did?! Combine the almonds, pistachios, and salt (if using) in the bowl of a large food processor and process for 10 minutes using the S-blade, pausing to scrape down the sides of the bowl every 2-3 minutes. After about 10 minutes, do not stop the food processor, just add your scoop of The Natural Citizen Organic Greens through the hole in the lid. Process for 4-5 more minutes until your Homemade Green Pistachio Almond Butter is good and liquid-y. (Your kitchen should smell like roasted pistachios at this point!) Scrape into a container that has a lid. Keep in refrigerator for up to 2 weeks. Check out these other Natural Citizen recipes!